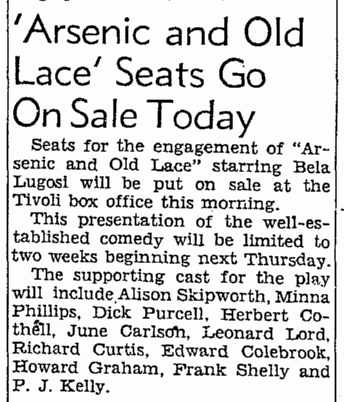 Bela Lugosi’s name was first linked to Arsenic and Old Lace in 1941. 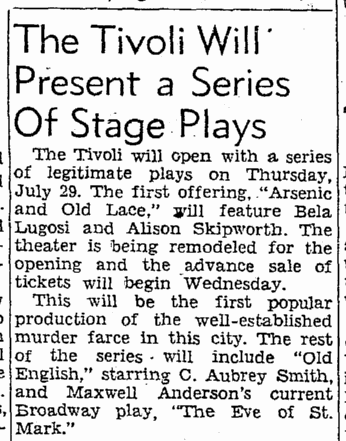 SAN FRANCISCO, July 24 – Blumenthal Theatres, operators of the Tivoli, are re-opening the house as a popular-priced legit spot, presenting a series of plays with New York casts. 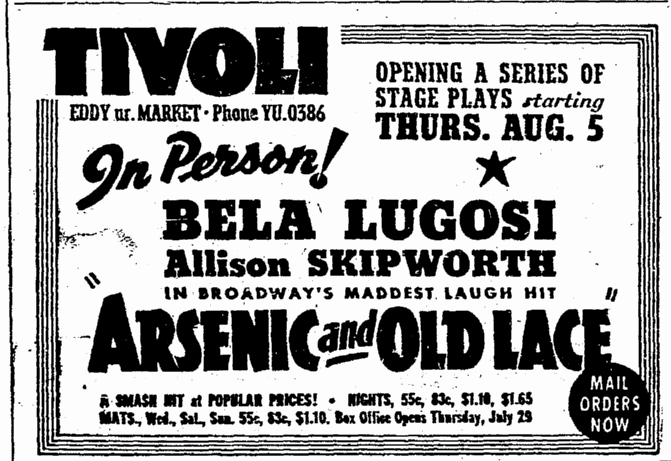 Opens July 29 with Arsenic and Old Lace, starring Bela Lugosi and Alison Skipworth. 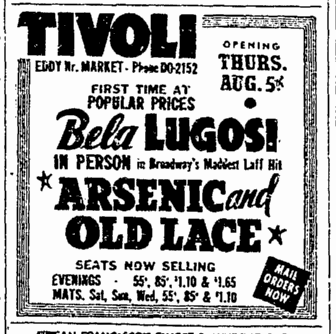 …MOE COSTELLO closed his theater and hotel business in Norfolk, Va., having sold his Cleveland Hotel interests there to Eddie Madden, and left for the Coast July 26. Has leased the Music Box, Hollywood, and Tivoli, San Francisco. Both house to play legit as part of the newly formed Pacific Coast Circuit, Inc., of which he and Raymond Payton, cousin of the late Corse Payton, are execs. 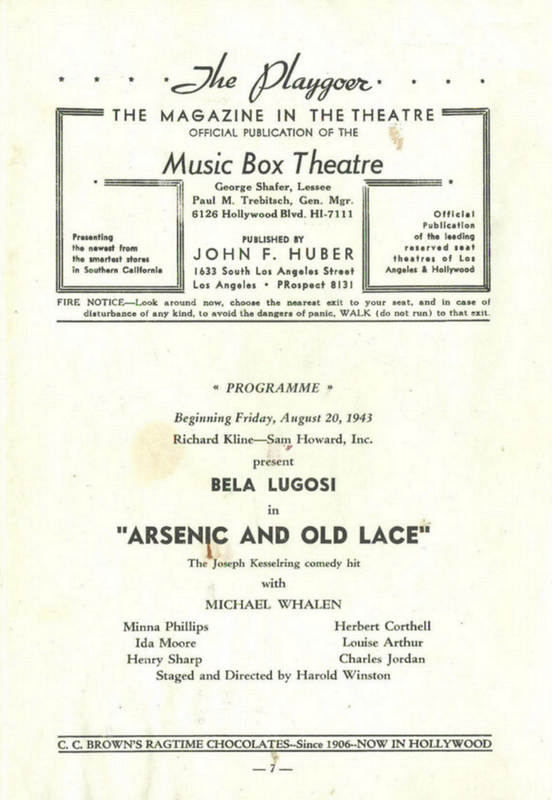 Music Box to open August 5 with Arsenic and Old Lace, featuring Bela Lugosi, with Old English to follow. I am here to report something which may prove starling at first. 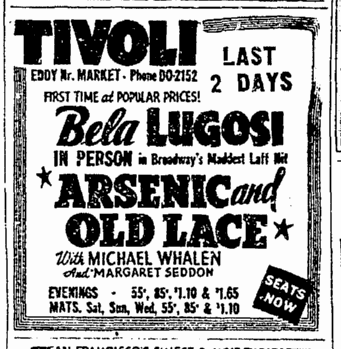 Don’t be too disillusioned, but Bela Lugosi had parsley omelette for lunch last Wednesday. 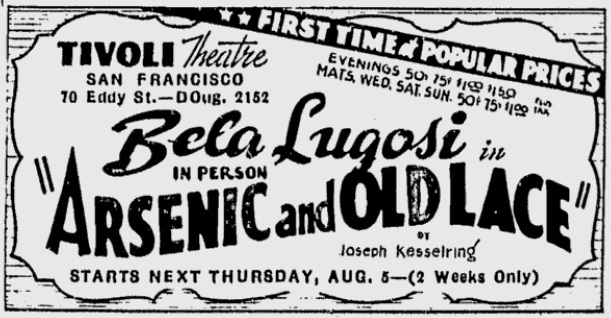 Contrary to any fly-by-night reports that may be circulating around, Mr. Lugosi does not exist solely off herbs and potions, nor does he have a mobile laboratory in which he practices alchemy before breakfast, as, I believe, was once a story given some credence by an overzealous press agent. 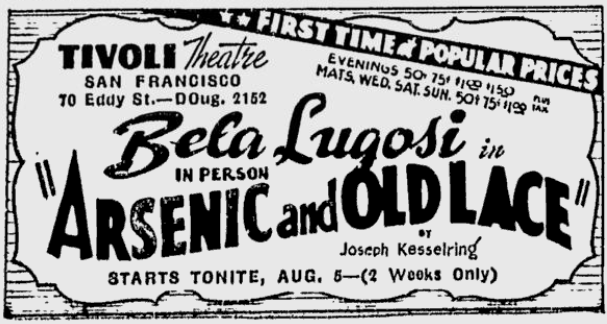 As a matter of fact, the occult, the pseudo-occult, and all the horrific Hollywood ramifications thereof, bore Mr. Lugosi considerably. That is, they bore him only insomuch as he has been forced, by a theatrical happenstance to overindulge himself in what Hollywood euphemistically calls horror. He is the actor who very name will strike terror into the heart of all but the most unsusceptible, and there is hardly a month goes by when he does not transplant the brain of at least one anthropoid into the body of a man, or hold a nocturnal tryst with a zombie. 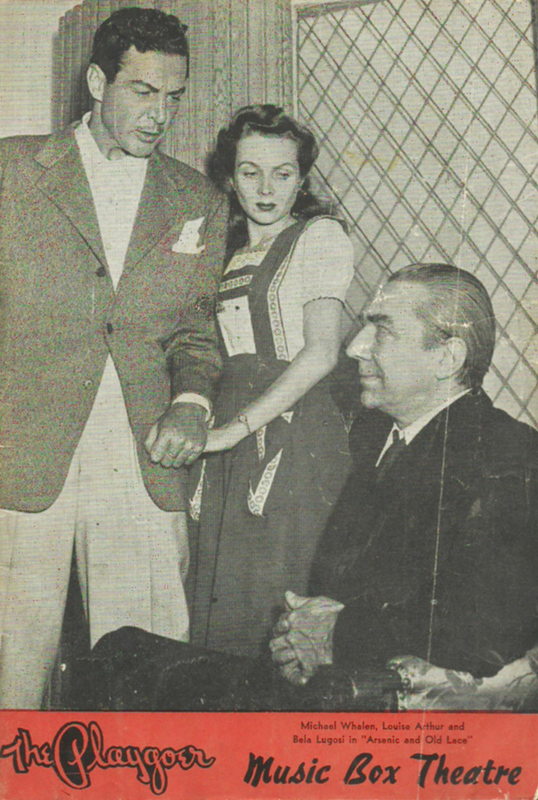 Not that Mr. Lugosi doesn’t look the part. He as the long thin fingers of an artist, the gaunt face with small searching eyes and black eyebrows which curl sinisterly around his eye-sockets until they almost touch the cheekbones, and the loose rambling frame which lends him an air of the unworldly such as one might find in Edgar Allan Poe. In truth it is not difficult to imagine him among his beakers and test tubes carrying on nefarious experiments in a subterranean crypt. 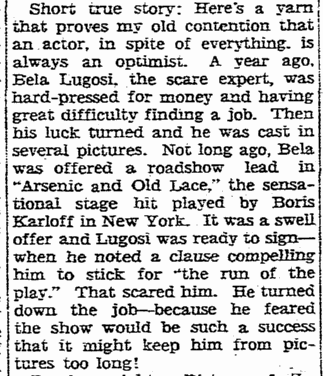 But Lugosi is not a professional ghoul, he is an actor. 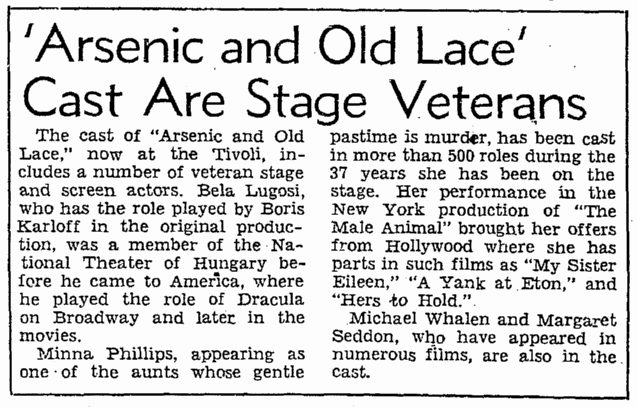 In Hungary where he was born on October 20, 1882, he trained at Budapest’s Academy of Theatrical Arts, and by 1913 was the leading actor in that city’s famous Royal National Theater where he played everything from Hamlet to Cyrano to Lilliom. His professional marriage to the horrors was consummated in 1927 when Horace Liveright, then a producer, was looking around for somebody to play Count Dracula in the American production of the fabulously successful English adaptation of Bram Stoker’s minor classic. From that day to this he has been playing Dracula in all the imitations and bastardizations of which the scriptwriters are capable. 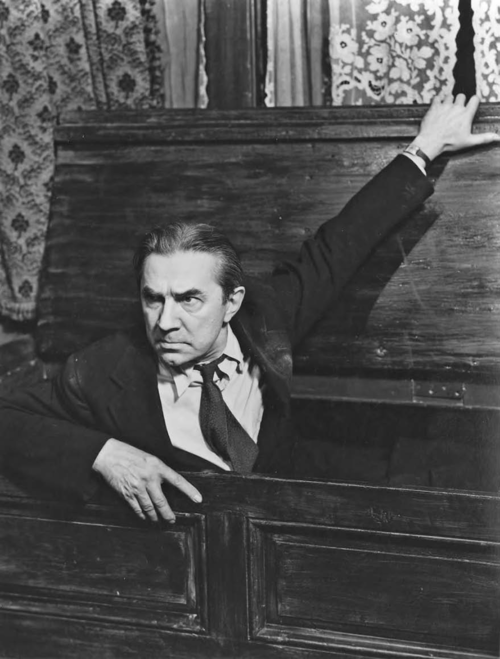 Dracula, says Lugosi, the only horror play ever written. He originally played it because it “added a new color to the rainbow of my character parts.” Then the rainbow became permanent. 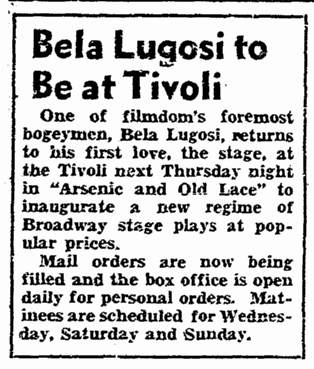 Lugosi’s interest ended there. From then on it was a marriage of convenience. He has never read any more of the world’s occult literature then might be expected of the normally alert reader. Her had read and admired A. Conan Doyle, but has never particularly appreciated the mystic in Doyle’s make-up which make the Sherlock Holmes series among the finest detective stories ever written. His favorite newspaper on the Coast (with which he is acquainted) is Los Angeles’ liberal Daily News. He had definite ideas about newspaper publishers and editorial policy. He subscribes to The Reader’s Digest, Time (which he took for 10 years and just recently gave up), The Nation, The New Republic, The New Masses, In Fact, and Forum, as well as a dozen Hungarian magazines. He has recently been active in forming a Hungarian anti-fascist committee among Hungarians in America, and was later elected president. Into this project he packs all the power of his political convictions. He knows his own people well enough to realize that “they cannot deal with the Nazi feudalism.” This man who goes around frightening little children at night is one of the most conscientious workers for what he calls 100% ideal democracy” during the daytime. In Hollywood, he has a wife and a 5½ year old son whom he installed in a house of his own design in North Hollywood. He makes on the average of 5 or 6 pictures a year, all of them bad. The average Hollywood horror costs upwards of $75,000 which is cheap by Hollywood standards. If a producer would spend money and employ topnotch writers, Lugosi thinks the movies could do something to equal the stature of Dracula. There is a place for a good horror picture; it suppliers a need which is best explained in the Greek theory of tragedy, a catharsis. The trouble with movies, Lugosi agrees, is that there are very few people who understand that what you can see, no matter how horrible, is not half as frightening as what you can’t see. It is the imminence and not the actuality. Only the great macabre writers like Poe understand that. 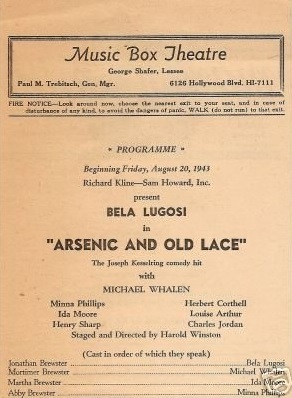 As it is, Hollywood has a peculiar tendency, Lugosi says, to turn a shocker into three degree entertainment, with a bludgeon instead of a rapier. Strangely enough, Lugosi’s house would seem to bear out in certain respects the popular notion of what the private life of the demonologist should consist. His estate is surrounded by a wall of four feet thick, with a large iron gate covered with elaborate grillwork and on which sets a sign reading, “Beware of the Dog.” To enter one must knock first (I think 3 times is the correct number) on a heavy oak door, whereupon, if his papers are correct, he is admitted through a tiny door to one side. Once inside he will find a spacious lawn with Lugosi’s Swiss chateau sitting in the middle of it. Inside the house, he will find high paneled ceilings, heavy leather furniture, windows set in lead, a large fireplace and a spittoon. There is no reliable information as to whether or not the Lugosis have a pet vulture sitting over the mantelpiece. I once met a man who claimed he saw it, but this no doubt was an hallucination. 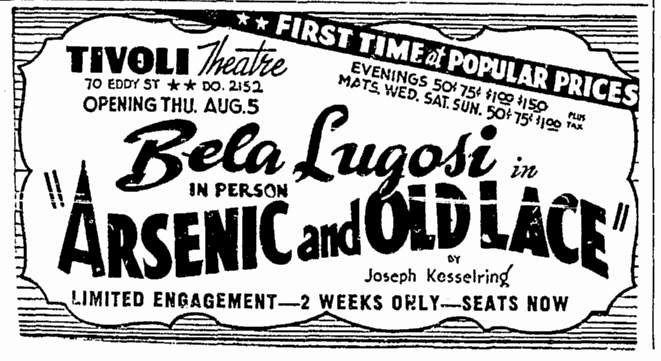 Besides the humanities, Lugosi’s interests lie in sculpting and hunting. He also has a mania for stamp collecting, a relatively pedestrian pastime in which he finds a curious fascination. 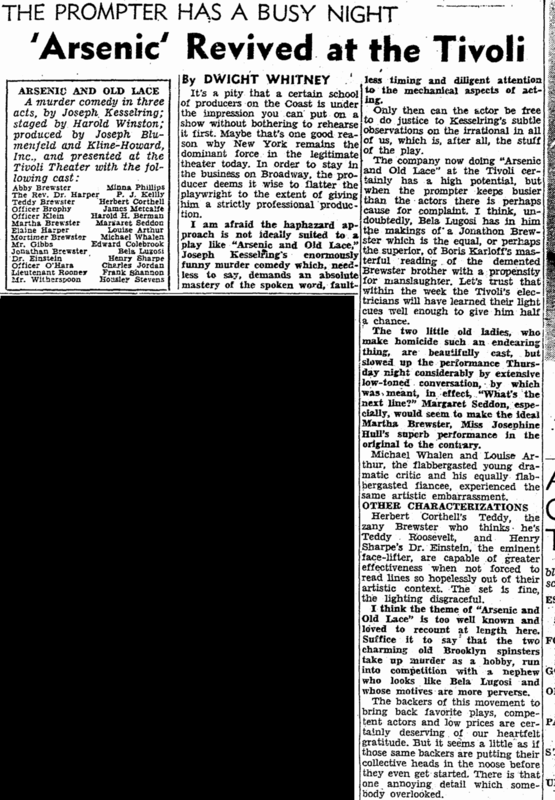 Since 1927, he has only appeared on the stage twice, Murder at the Vanities for Earl Carroll in 1933, and a recent revival of Dracula (which he says was in every way up to the original company) in which he toured the East. He is here to do a play of which he is particularly fond—for two reasons. First, it is a magnificent comedy to him, and most important, it partially emancipates him temporarily, for the limitations of the type of role he has always had to play. 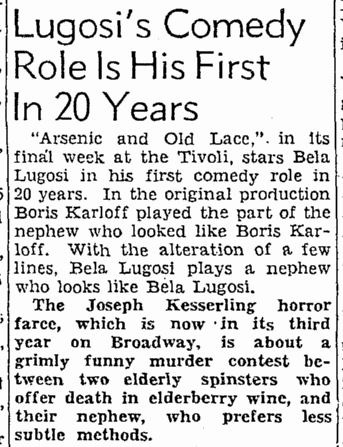 He has never seen Boris Karloff play Jonathan Brewster in Arsenic & Old Lace. This he deems fortunate because an actor will automatically pick up certain mannerisms for watching another actor play the part, no matter how hard he may try to keep his interpretation absolutely original. 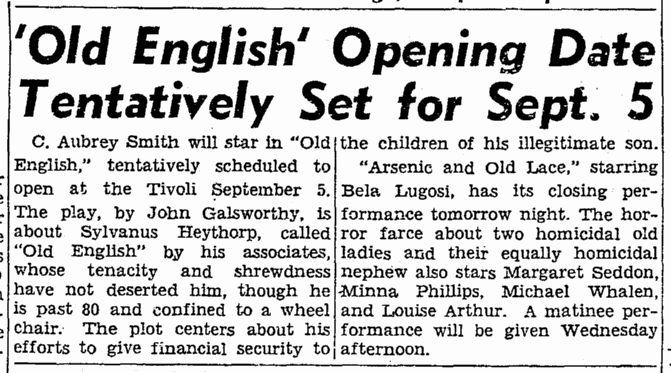 Lugosi will play a role as he sees it; as far as he is concerned he’s working in virgin territory. There is no positive clue to indicate how deep is his sorrow at having graduated from the Royal National Theatre where the actor makes the director, to Hollywood, where he director makes the actor. He remembers the day in Budapest when the public would not allow even the greatest hit to play more than three performances, and the actors were elected to repertory group for life and supported by the state. He remembers, too, when he played the Latin apache, hot-lover type. Meantime, he is making plans to get back to a ruined castle on the studio lot, where Universal will be charmed to have him play three zany scientists and a gorilla man within the course of the next six months. SAN FRANCISCO, Aug. 21. 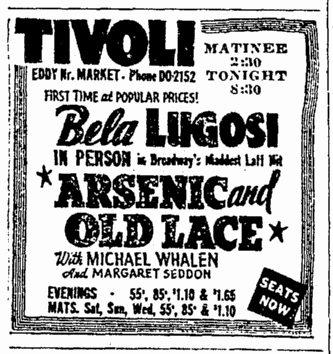 – With a $1.50 top, Arsenic and Old Lace, featuring Bela Lugosi, grossed a neat $17,000 at the Tivoli two weeks ended 18th. 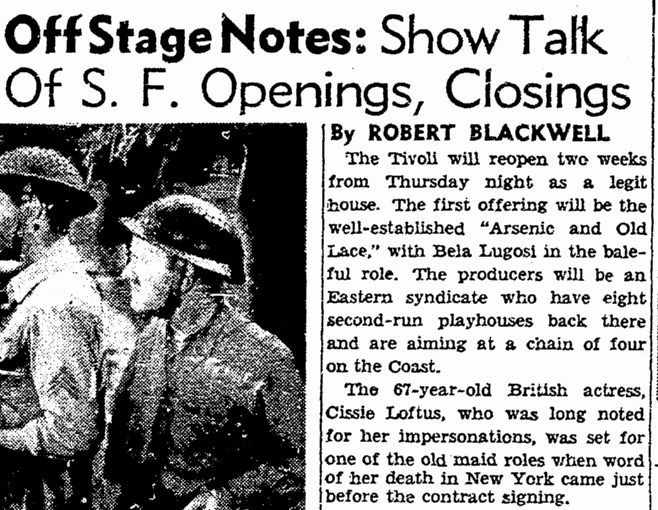 Springtime for Henry, with Everett Horton is set to follow, opening the 26th. Does a tragedian yearn to play comedy, same as a comedian wants to be a tragedian? 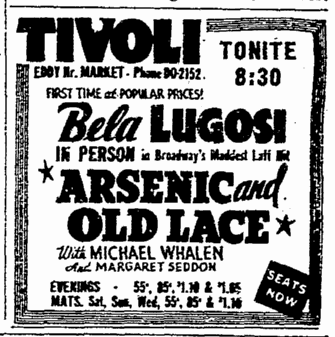 Yes, take it from Bela Lugosi, now appearing in Arsenic & Old Lace at the Music Box Theater. Lugosi was supping on salad, not crunching bones as might have been expected. For he has no time for dinner between working on the film Return of the Vampire during the day, and Arsenic at night, so eats after the night show. Then he dashes to his Valley home—a slightly forbidding looking place—maybe to scare off autograph hunters, somebody suggested. 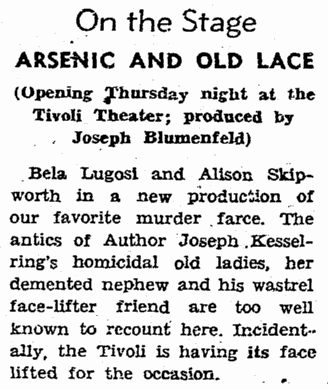 Will Arsenic & Old Lace kill horror pictures and plays, as ridicule is supposed to kill anything it touches? 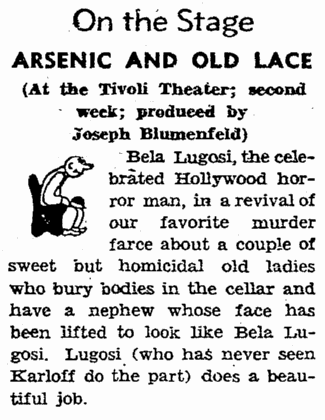 No, says Lugosi, but will make producers put more comedy into their spine-congealers. For there are always the kids who like them. Why do children enjoy horror plays and pictures? Because, says Lugosi, of a subconscious atavistic feeling in born in hem through catastrophes which befell their forbearers centuries ago. Children like to see fearsome happenings from a safe position. 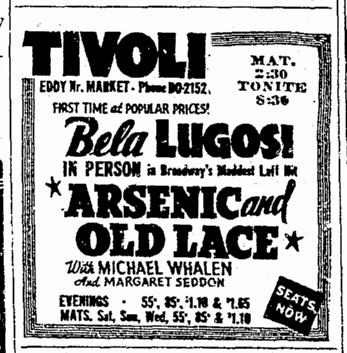 What about that Lugosi accent in Arsenic? Well, he’s supposed to have traveled the world and might have got himself one. Speaking of that accent, Hollywood tells a good one about how Gregory Ratoff, No. 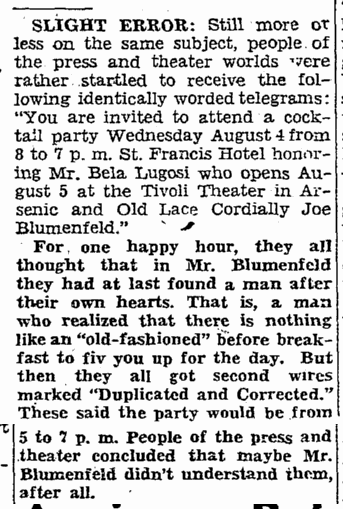 1 accent spiller, when Lugosi was playing Tovarich at the Biltmore, got sown in the orchestra pit at rehearsals, and prompted Bela how to recite his line without accent!